The assembled photographs tell a grim tale of violent class relations in the twentieth century. 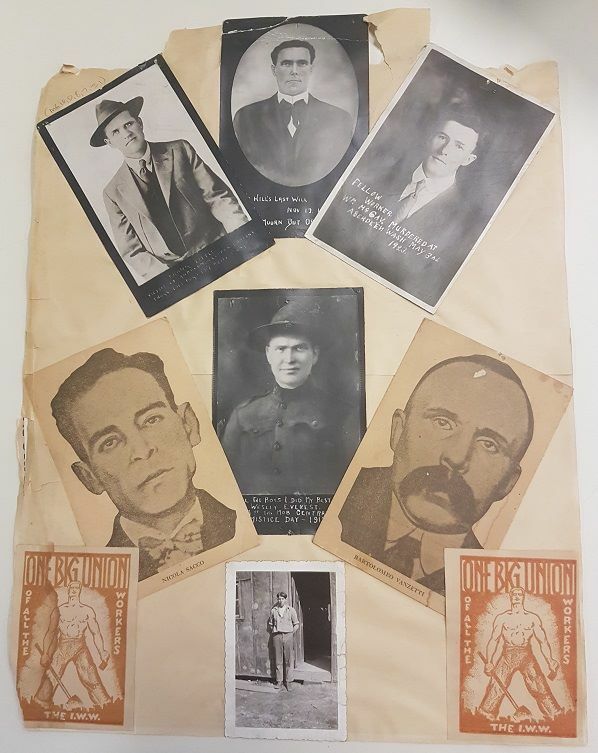 The trial and execution of three of the men featured in the collage – union artist and songwriter Joe Hill and the Italian anarchists Nicola Sacco and Bartolomeo Vanzetti – attracted worldwide attention. All three became powerful symbols of a judicial system tarnished by an anti-immigrant bias that fueled their convictions, a prejudice further intensified by their political beliefs, and expedited by their low economic status. While lesser known, the other three men in the collage – union organizers Frank Little , Wesley Everest, and William McKay – all lost their lives brutally at the hands of anti-union vigilantes. Since their murderers were never apprehended, their deaths appeared to confirm to others like them – poor, itinerant workers who sought to improve their incomes and working conditions through collective action – that the law did not apply equally to all people. Of the six men, only Sacco and Vanzetti did not belong to the Industrial Workers of the World (IWW or Wobblies) union. However, all of them shared a vision of a new social order based on the common ownership of all instruments of production, controlled directly and for the benefit of the workers that create the wealth of the world. Whether they called this anarchism, industrial democracy, or the cooperative commonwealth, all six men paid the ultimate price for their ideas and efforts to better the lives of the working class. While the anti-capitalist dimension of this vision put them at odds with the powers that be, their deep skepticism about electoral politics, and insistence that the new society and the means to attain it must be self-governing, distinguished them from other left-wing groups. The collage itself was found tucked inside of a Lumber Workers’ Industrial Union (OBU/IWW) account ledger dating from the 1920s. Its rediscovery is a fortuitous by-product of the “Increasing Access to the Finnish Language Archives” project, a partnership between the Thunder Bay Finnish Canadian Historical Society and the Lakehead University Archives. The aim of the Documentary Heritage Communities Program-funded project is to increase access to Finnish-language materials contained in the Lakehead University Archives through improved description, digitization, and select translation of key documents into English. Over the decades, the account ledger itself transformed into a scrapbook, composed mainly of Finnish and English-language IWW magazine and newspaper clippings, one record gradually supplanting another. 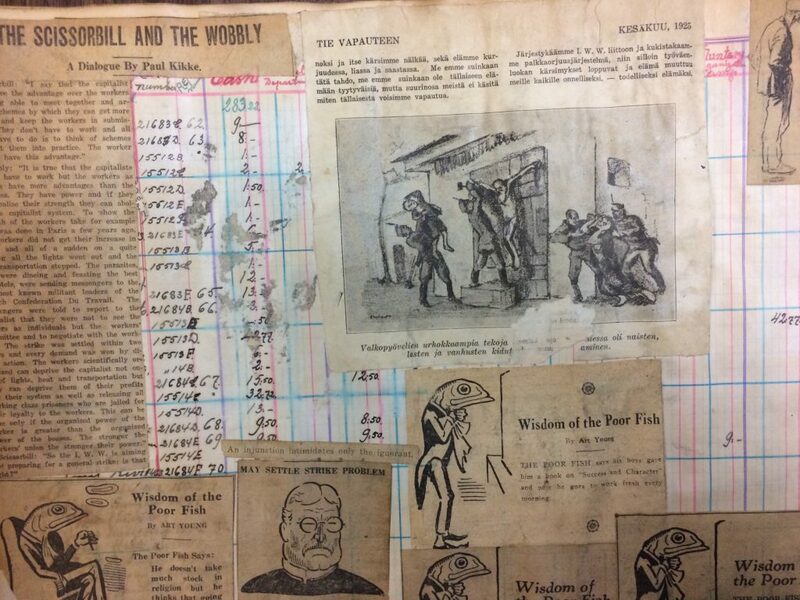 Pages unconcealed by newspaper clippings reveal that the ledger records union income and expenses during the period when large numbers of One Big Union (OBU) loggers in northern Ontario transferred membership to the Lumber Workers Industrial Union of the IWW. Another rival lumber workers union also emerged from the ashes of the declining OBU, the Lumber Workers Industrial Union of Canada (LWIUC). The LWIUC distinguished itself from the Wobblies by its alignment with the aims and methods of the Communist Party. Thunder Bay, previously the twin cities of Port Arthur and Fort William, still boasts the highest concentration of people of Finnish ancestry outside of the Nordic countries. Finnish immigrants played a pioneering role in the development of the labour movement in northern Ontario through the first three decades of the twentieth century, above all in the logging industry. Small wonder then that a substantial portion of the Finnish-language archives relate to left-wing, labour, and cooperative movements as well as the various Finnish ethnic organizations that supported these initiatives. During the inter-war period, no less than four Finnish IWW halls operated in the District of Thunder Bay alone. The Finnish Labour Temple in Thunder Bay, the most important of these halls, served as the headquarters of the Canadian IWW Administration from its establishment in 1932, off and on, up to 1960. The collage is pasted on to IWW stationary bearing the address of the Labour Temple – 314 Bay Street. 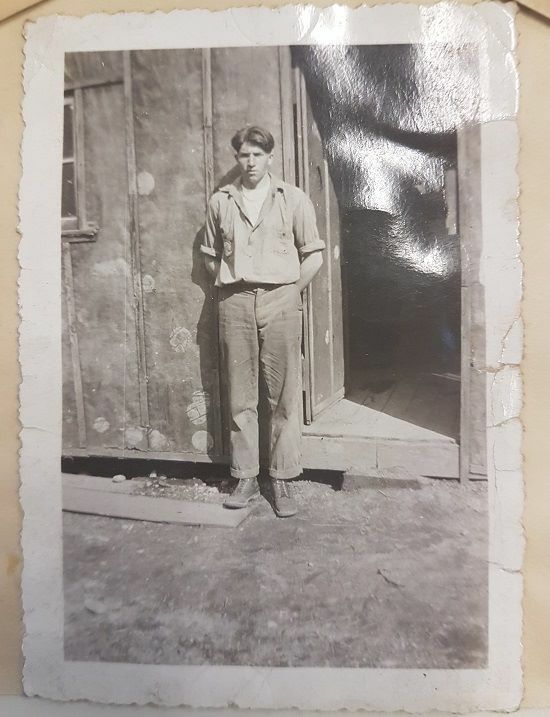 If the unidentified individual in the collage was indeed from Thunder Bay, or the surrounding region, who could he have been? It is highly unlikely that the image is of either Viljo Rosvall or Janne Voutilainen, the two best-known local martyrs to the cause of organized labour in Thunder Bay. Rosvall and Voutilainen disappeared on November 18, 1929 sometime after visiting the logging camp of subcontractor Leonard “Pappi” (Priest) Mäki on Onion Lake. They had been dispatched to the remote camp by the LWIUC in an effort to persuade the loggers there to join a strike. The bodies of Rosvall and Voutilainen were discovered the next spring in shallow water amid widespread rumours of murder. An inquiry ruled that their deaths were accidental drownings. Not only does the unidentified man in the collage not resemble either man, but another important consideration is that the IWW and the Communist-led LWIUC, to which both Rosvall and Voutilainen belonged, were rival labour organizations hostile to one another. A lesser known candidate is Urho Jaaska. On October 18, 1932, Jaaska joined a demonstration of somewhere between 500 to 1000 unemployed workers in a march to Port Arthur Mayor P.V. Ibbetson’s home. The assembled crowd demanded an answer to two questions: “what are we going to eat and where are we going to sleep tonight?” Eight police mounted on horseback charged the crowd while police of foot chased demonstrators with batons. In the ensuing melee, Urho Jaaska was injured and died in hospital nine days later. An all Anglo-Saxon coroner’s jury in the inquest of Jaaska’s death required only 15 minutes to return a verdict that absolved the police of any wrongdoing. The jury concluded that, given an absence of any marks of violence on the body, the victim had contracted tetanus from a scratch on his nose and succumbed to lockjaw. Witness testimony from six of Jaaska’s friends was largely disregarded in the verdict, including claims that Jaaska had been knocked unconsciousness and woken up, with two police officers standing over him, bleeding from the nose and mouth. No known photographs of Jaaska are available with which to compare to that of the unidentified man, so the possibility that he is in fact Urho Jaaska cannot be entirely ruled out. However, the robust involvement of the Communist Party-affiliated Canadian Labor Defense League in the Jaaska case again suggests ideological incongruence. The final, and strongest candidate, is Louis Rosenberg (alias Lou Walsh). There is very little biographical information available about Rosenberg, and no known photographs exist, making positive identification extremely difficult. The basic outlines of his life can be partially reconstructed from his union records and a few other sources. Rosenberg was an itinerant worker from Toronto who joined the Agricultural Workers Industrial Union of the IWW in January 1933 but transferred membership into the IWW Lumber Workers Industrial Union in 1934. As an active IWW member, Rosenberg took part in the Thunder Bay strike of 1934 and the Algoma District strike of 1935. In 1937 he left for Spain to volunteer in the fight against General Francisco Franco’s coup d’etat. The Spanish Civil War (1936-1937) pitted multiple, yet deeply divided, left-wing and liberal forces supported by the Soviet Union against an Italian and German backed fascist insurgency. Rosenberg is one of only two known Canadian volunteers in the Spanish Civil War to join the Durruti Column (reorganized into the 26th Infantry Division in April 1937), the other being Bill Wood. Named after the anarchist leader Buenaventura Durruti, the column was composed mainly of anarcho-syndicalists loyal to the Confederación Nacional del Trabajo (CNT; National Confederation of Labour) union. Rosenberg and Wood both joined the International Shock Battalion of the Durruti Column, possibly the Sacco and Vanzetti Centuria. A note in his union records states that he was killed on the Aragon front near Huesca on June 15, 1937. Rosenberg died an IWW member in good standing as his dues had been paid up until August 1937, nearly two months after his death. It is possible that the identity of the man in the black and white photograph will remain a mystery. However, his anonymity should not prevent us from recognizing him as a casualty of class conflict. Like the other men in the collage, this recognition should continue to be interpreted and reinterpreted according the needs of our times. In this way, perhaps, his namelessness aptly parallels the invisibility of the precarious worker and the struggles in the hidden hinterlands of global capitalism. The late folk singer U. Utah Philips often discussed the importance of history in relation to the concept of the “long memory” or “that connective flow of thoughts and events that clarifies our vision, not of where we’re going, but where we want to go.” The unrealized project for a world free of discrimination and poverty that these men stood for, unfortunately, remains as poignant as ever. Their commemoration is a reminder of how far humanity has come and how far we have yet to go. Saku Pinta is an independent scholar based in Thunder Bay, Ontario and the Finnish Archives Specialist for the “Increasing Access to the Finnish Language Archives” project. He gained his PhD from Loughborough University in 2013. Pinta’s research has concerned left and labour movement ideas and history with a focus on libertarian communism and the intersections between anarchism and Marxism. Most recently, his research has concentrated on the history of the Finnish North American left and the Industrial Workers of the World union in the twentieth century. Port Arthur News Chronicle, October 19, 1932. What an excellent piece of research and writing! Thanks!